To celebrate the extended ranging of our Haloumi cheese, we have created a new speedy weeknight recipe that is absolutely delicious! We have borrowed the Greek Yoghurt salad dressing from our good friends at MOO. 2 Remove skin from the outside of the pumpkin and chop into cubes. Place on a prepared baking tray and coat with olive oil. Bake until tender. 3 While pumpkin is baking, slice haloumi into strips and pat dry with a paper towel. Place a frypan over medium heat and add olive oil to the pan. Allow olive oil to become hot first, then place strips of the haloumi along the bottom of the pan. Cook for 2 minutes, or until well-browned on the bottom. Turn the haloumi slabs over with a spatula, taking care not to splash the hot oil. Brown them on the other side. Just as they finish cooking, sprinkle the dukkah and squeeze the lemon juice across all of the haloumi. Remove from heat immediately. 4 Place MOO Greek Style Yoghurt, olive oil, lemon juice and honey in a bowl and whisk. Once evenly combined add a sprinkle of chili, mint and salt, and mix thoroughly. 5 Divide spinach and coleslaw vegetables across four bowls. 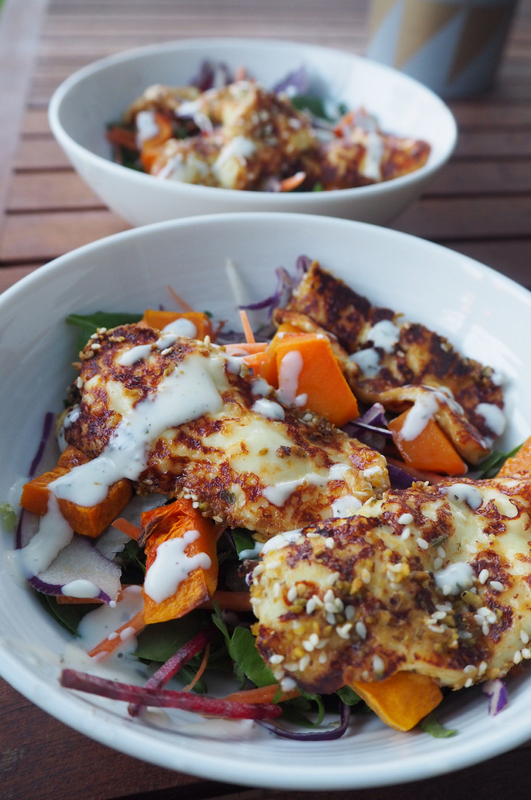 Place pumpkin pieces and haloumi strips on top of each salad. Drizzle the yoghurt salad dressing as desired and enjoy!